First Lady Melania Trump wearing Diamond Princess Cut Stud Earrings. You could not miss First Lady Melania Trump and her enormous Diamond Princess Cut Stud Earrings on Inauguration Day. Her stud earrings were absolutely stunning to say the least. These diamond princess cut stud earrings perfectly accent her Ralph Lauren baby blue ensemble. They had all the class and sophistication needed to complete her elegant look. As a result, Melania Trump’s soft updo allowed her diamond princess cut earrings to sparkle and light up her face. Her outfit was completed with those large diamond princess cut stud earrings. They made a statement and pulled her outfit and hairstyle together for a flawless look. Consequently, many compared her to the late Jackie O.
Channeling Jackie O.: Melania Trump, 46, looked every bit the First Lady at Donald Trump’s inauguration on Friday, January 20, 2017. Melania Trump with Diamond Princess Cut Stud Earrings and her 25 Carat Emerald Cut and Baguette Engagement Ring. First Lady Melania Trump took the look with her stud earrings all the way into the night. She wore her diamond princess cut square stud earrings in addition to her 25 carat emerald step cut and baguette engagement ring. 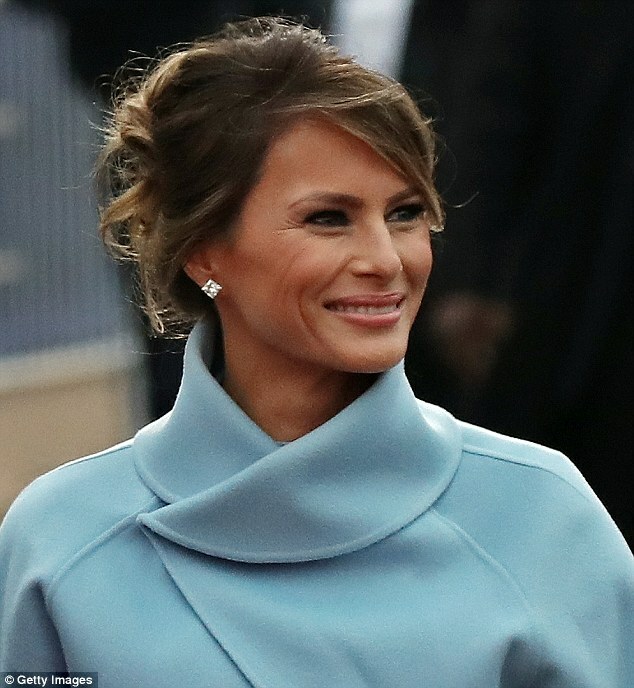 First Lady Melania Trump has a great sense of fashion that most of all was beautifully accented by the simple styling of her elegant diamond jewelry. Ziamond offers you the flexibility of enjoying stylish jewelry options. Get the look of First Lady Melania Trump’s princess cut stud earrings. Purchase your very own simulated diamond look princess cut stud earrings while at a fraction of the cost. As a result, you can get the exact same look worn so beautifully by First Lady Melania Trump. Choose from 14k white gold, 14k yellow gold, 14k rose gold, 18k white gold, 18k yellow gold, and platinum. Ziamond offer standard push backs, screw backs and the highly recommended large backs for all our stud earrings. Additionally, we offer additional color options that include canary yellow and pink diamond looks. Man made gemstone stone color options include sapphire blue, emerald green and ruby red. Ziamond also offers a wide selection of carat sizes and diamond shapes to suit every lifestyle, so get youself a pair of must have diamond look stud earring from Ziamond today!